Aqua Lung has been making scuba gear for over 70 years and the care and attention to detail shows in the i750TC. The PVD finish is durable, resistant to wear, and does not reflect sunlight in shallow water. Data retention stores your dives and settings even when you are changing the battery. The bright OLED color screen is vivid and easy to read, and the intuitive operation is easy to understand. This is a dive computer simple enough for a beginner but versatile enough to grow with a diver as they become more advanced. The bragging rights on the i750TC are definitely the OLED display, with variable brightness, rich colors, and an easy-to-read, easy to navigate operation. Three buttons make screen navigation a bit faster than two, which is a nice feature. Aqua Lung has packed a lot of features into a dive computer scarcely larger than a sports watch. 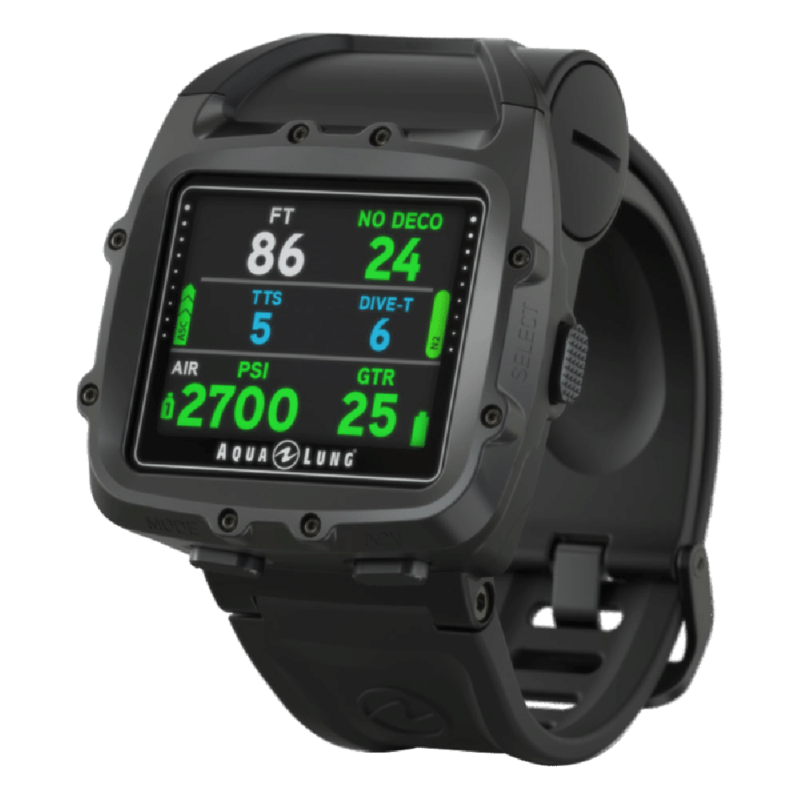 The three-axis compass, advanced pairing with a mobile app and social sharing, bright display, and useful features make this an excellent dive computer from a legendary brand. Who is Dive Computer Designed For? Below is a video review of the i750TC done by Luke Fosburg over on Youtube. In the video, you can get a closer look at some of the features and functions of the dive computer as well as his thoughts about the computer. If you would like to know what we think of the computer, continue scrolling below. The OLED display is bright and crisp, with settings to adjust to a variety of light conditions. The color-coded alarms on the display are a helpful way to quickly monitor safety. The Aqua Lung i750TC stores settings and data even when you are changing the battery, which is a convenient feature. Once it’s paired with an Aqualung transmitter, it’s paired for life and never has to be repeated. These little features make it simpler and easier to use the i750TC for years to come. The Bluetooth and data management on the Aqua Lung i750TC not only allow you to log and analyze your dives, but you can program the dive computer remotely from your device. You can even store and share videos from your dive when paired with your mobile device. The attractive watch-like look, bright crisp display, and advanced technology make the i750TC an very well-designed dive computer. A simple user interface definitely makes it easy to use and easy to understand. It is expensive. Might be too much of an investment for someone just starting out. The Aqua Lung i750TC has all the features beginning and intermediate divers need, in an attractive. compact design. The bright display is clear and easy to read, and the combination of visual color warnings with audible alarms keeps safety simple and clear. It uses the popular Pelagic Z+ algorithm, which is less conservative than some algorithms, lengthening dive times while still easing safe ascents. While some feel that Pelagic Z+ may not be conservative enough for brand new divers, it’s worth remembering that it’s been used safely by divers for decades, and shouldn’t be a cause for concern when followed properly. The screen does not manage sun glare well and can be difficult to read in bright light, even when underwater. Adjusting screen brightness is important, and not intuitively done within the interface. Divers should refer to the manual ahead of time to learn how to adjust it. The related DiverLog app is not free, and not very well reviewed, so some of the device-driven capabilities and social sharing features of the Aqua Lung i750TC may not work as well as claimed. The price is fairly high, reflecting the advanced technology of the i750T. It may be a bit too expensive for a beginner, but the i750T is durable enough that it can grow with a diver as their skills advance, and for many, it may be the only dive computer they ever need. Can the i750TC be paired with other brands of transmitters? No, it has to be paired with an Aqua Lung transmitter. Their transmitters are high quality, with a “pair for life” feature that prevents it from accidentally pairing with another device. They are also fairly expensive. Can I monitor my buddy's air supply as well? The Aqua Lung i750TC is a very good dive computer, with attractive features and high-tech capabilities that will appeal to people who want to plan their dives from their laptop or mobile device. It’s simple to use, but robust enough, and has the capabilities that will take a recreational diver from beginning to intermediate or advanced. It may seem expensive, but it’s an investment that could pay off for years to come.